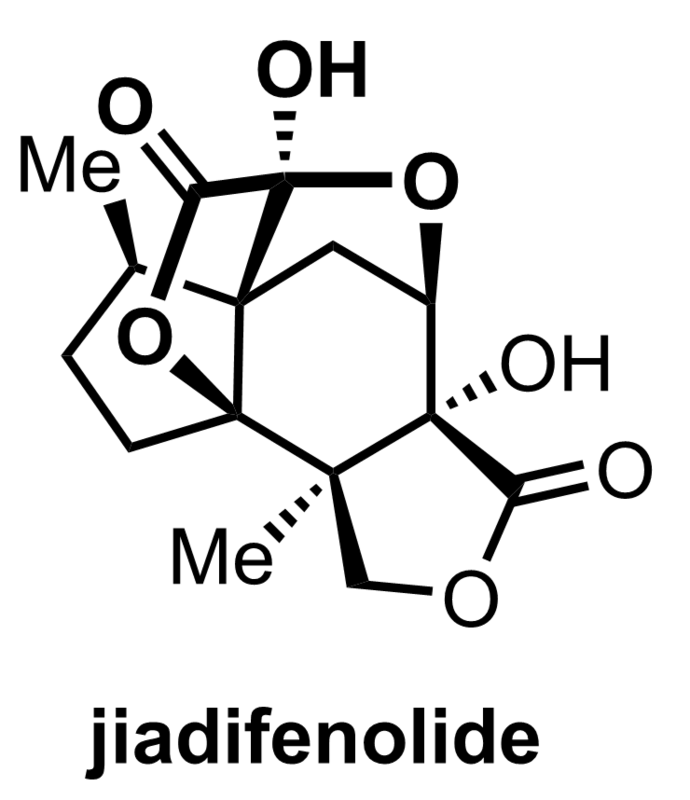 As promised months ago here is the write-up of the second Jiadifenolide synthesis published this year. 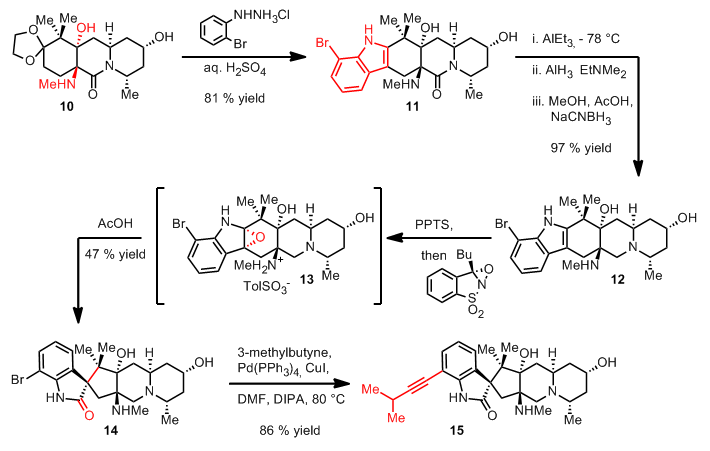 The main features of this synthesis from the Paterson group consist of a boron-aldol reaction and a neat SmI2 mediated radical cyclization. 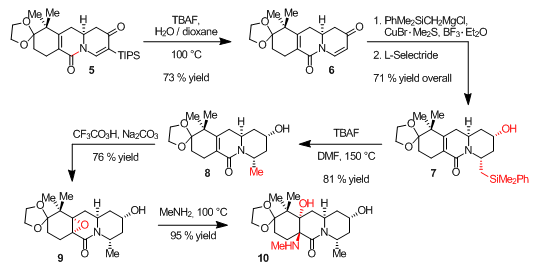 Though a racemic synthesis (like in the good old days) this route provides an efficient and highly selective access to Jiadifenolide. 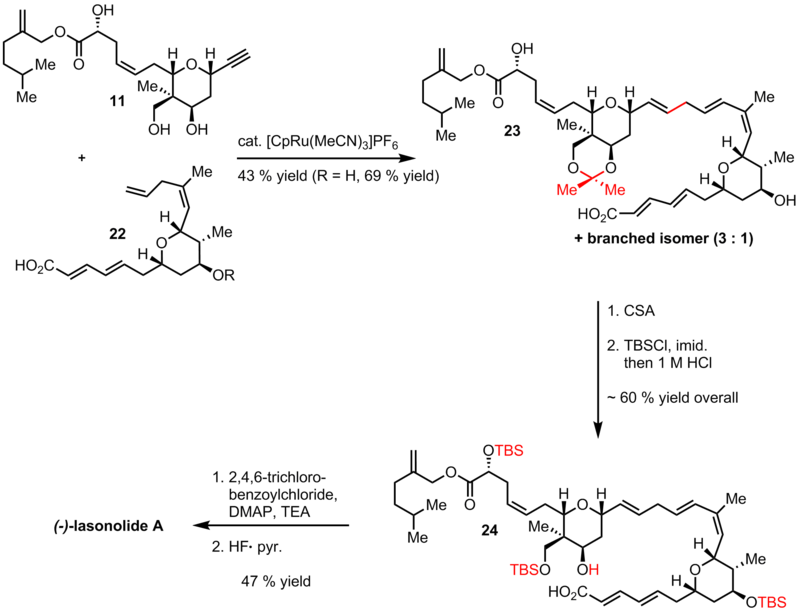 The synthesis started with Luche reduction of cyclopentenone 1 which in turn was treated with mCPBA followed by TBS protection to give oxirane 2. In the presence of BF3 the epoxide rearranged to the corresponding ketone with excellent diastereocontrol. HWE reaction, LiAlH4 reduction and acylation then delivered allyl acetate 5. 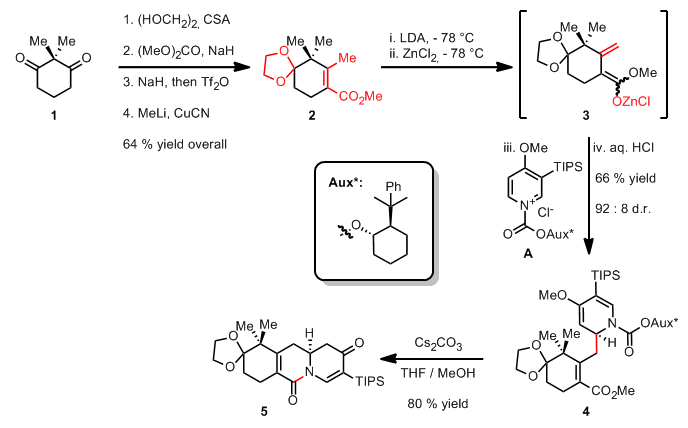 Silylketene acetal formation and subsequent heating in benzene resulted in Ireland-Claisen rearrangement to yield after another LiAlH4 reduction alcohol 6 in moderate yield. Hydrolysis of the TBS ether and global Swern oxidation finally furnished 7. The remaining carbon skeleton was attached utilizing the boron enolate of lactone 8 followed by TES protection. Upon treatment with samarium diiodide the last quaternary center was formed giving tricycle 10 in good yield. A possible transition state is depicted below. Deprotection and PCC oxidation then delivered ketone 11. The hydroxyl group at the ring junction was then introduced by a Rubottom oxidation, the ketone subsequently reduced and protected. 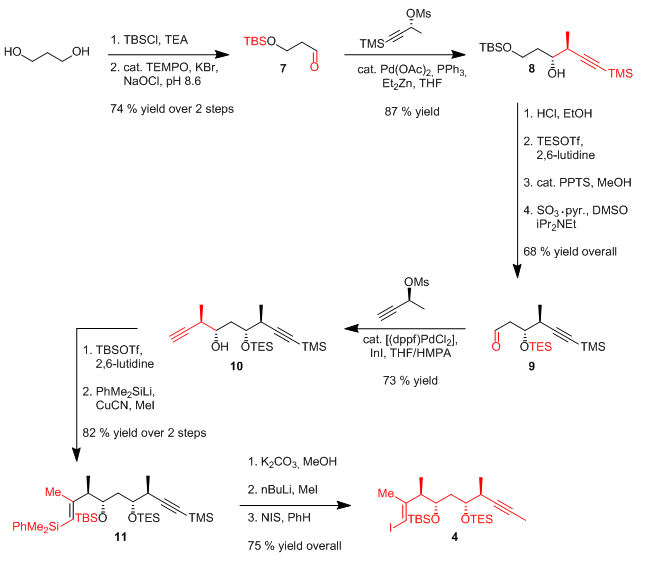 All that remained was dihydroxylation of the double bond, oxidation to the pyruvate and deprotection of the TES group to complete the synthesis. I decided to have a closer look at this and a second paper from the Martin group quite a while ago but I could not find the time to finish the write-up. I recently moved to a new place and had to get everything managed in time… Well I am not done yet but somehow I found the time to get this first piece done. The second paper on this topic will follow within the next few days. 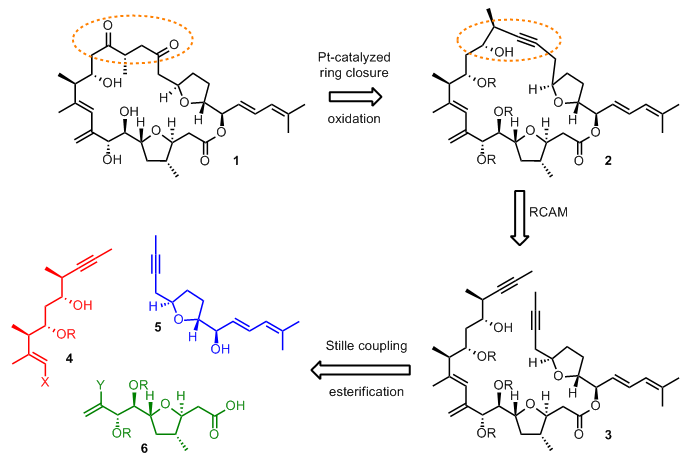 At the outset of Wood’s work the group decided to target the different stereocenters independently. This would enable them to diversify the strategy later towards the synthesis of different members of this class of natural products. 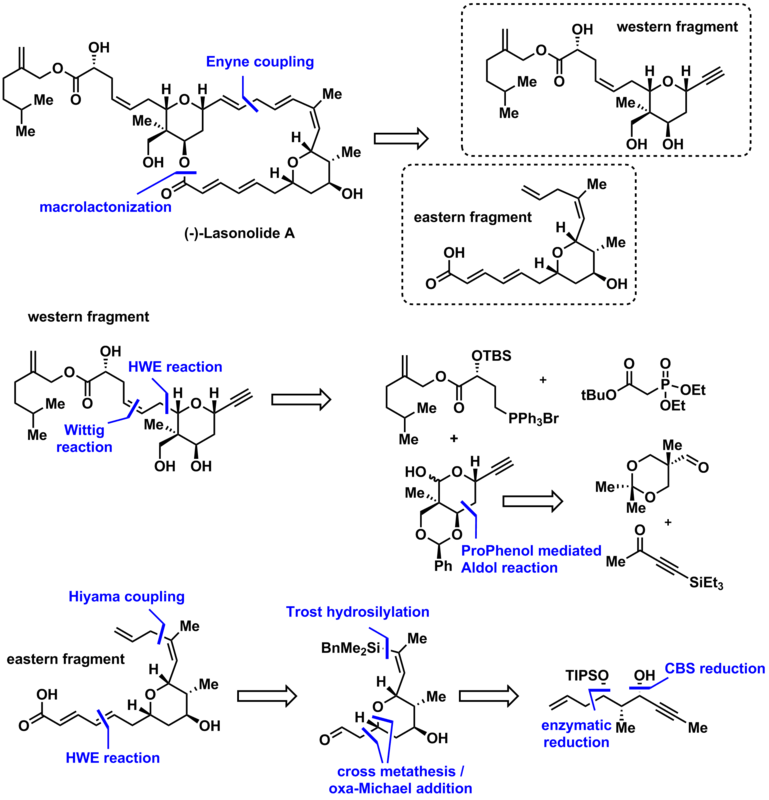 It should be noted at this point that their initial strategy made use of L-alanine which was expected to yield ent-citrinadin B. Instead it turned out this strategy actually furnished citrinadin B. The retrosynthetic analysis is shown in scheme 2. Gold mediated oxygenation of an alkyne would introduce the side-chain ketone while the epoxide derives from Enders’ epoxidation. Sonogashira cross coupling and regioselective epoxide opening would then lead to the bromo-oxindole shown. Extrusion of one carbon via Corey-Chaykovsky epoxidation and [3+2] nitrone cycloaddition leads to the unsaturated ketone depicted. 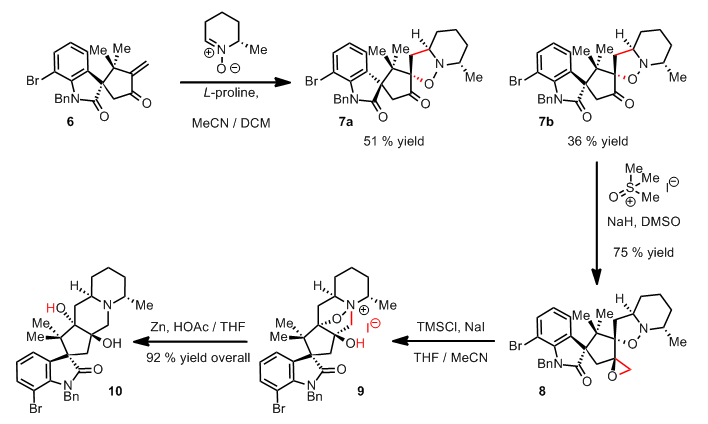 Reductive Trost enyne coupling and Heck coupling ultimately tracks back to dibromoaniline and L-alanine derived nitrone. 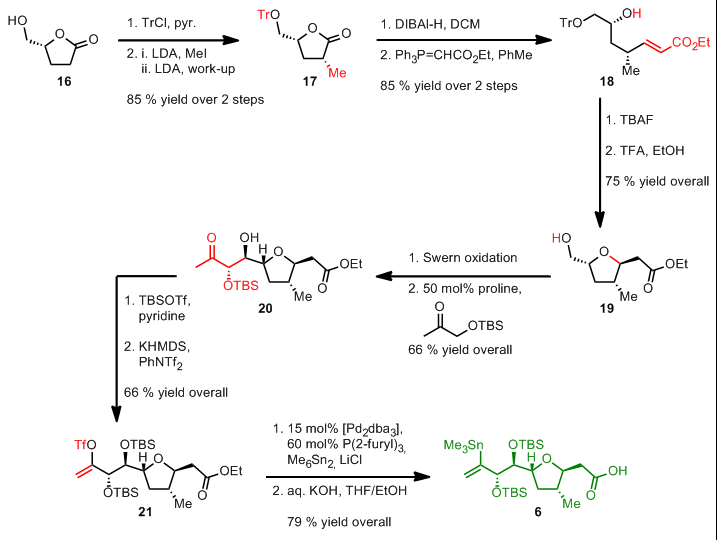 In the first step dibromoaniline 1 undergoes trimethylaluminum mediated amidation and TBS protection to give enamide 2 which cleanly underwent Heck reaction to give 3 as the expected racemic mixture. Benzylation of the amide nitrogen, TBS cleavage and Swern oxidation of the resulting alcohol then furnished aldehyde 4. 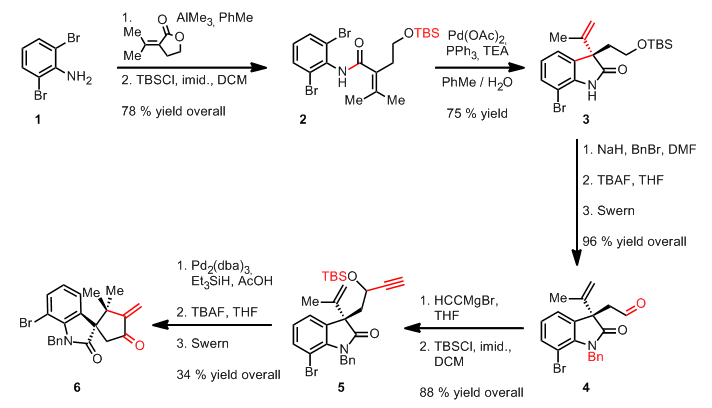 Alkynylation and another TBS protection set the stage for a neat reductive Trost enyne coupling. 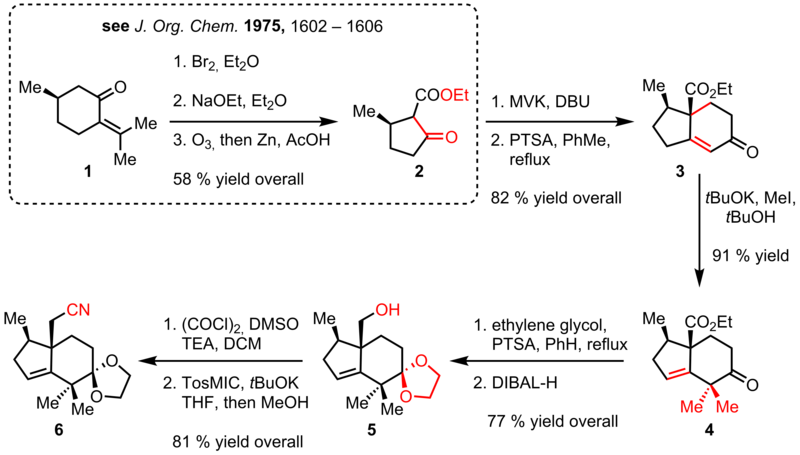 Desilylation and Swern oxidation produced unsaturated spiro ketone 6. 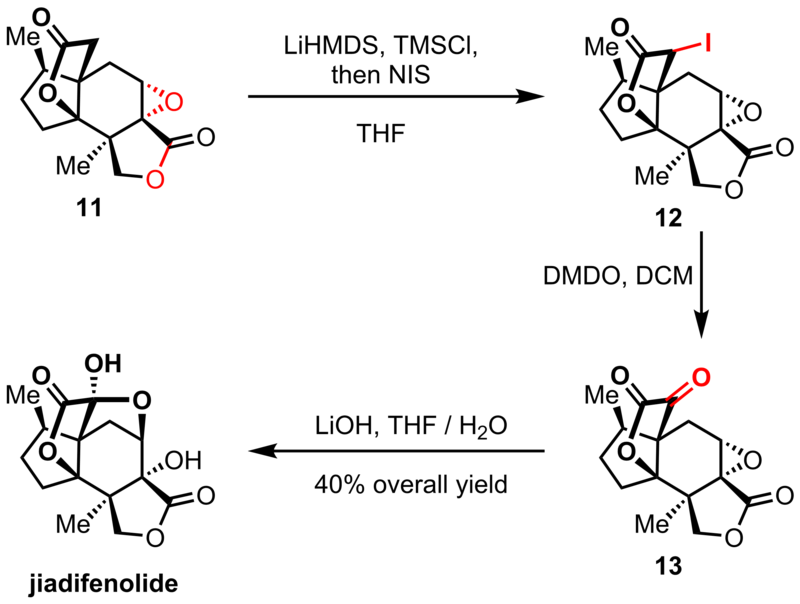 As mentioned above the group needed a racemic mixture to explore the synthesis of other members of this group of natural products containing the enantiomeric spirocyclic center. With ketone 6 in hand the crucial nitrone cycloaddition was examined. Fortunately the group found that in the presence of L-proline only two of the four possible diastereomers were formed in moderate and good yield, respectively. Though diastereomer 7b displayed the minor stereoisomer the group was able to produce enough material by this strategy. Corey-Chaykovsky epoxidation was used to introduce the missing methylene group. This was opened by in situ generated TMSI to give ammonium salt 9 which was reduced under Clemmensen conditions yielding diol 10. 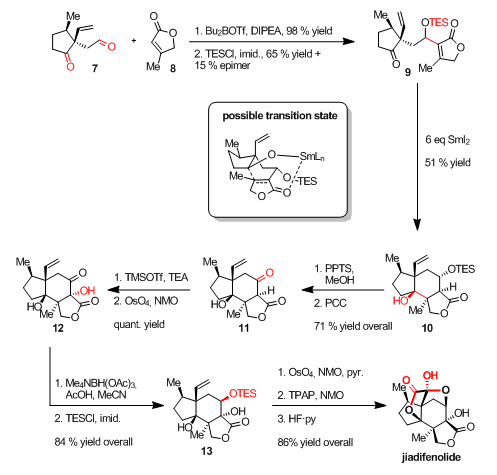 Moving on with the synthesis the group transformed the diol into the corresponding epoxide 11 by chemoselective mesylation and cyclization. Sonogashira coupling and concomitant oxidative debenzylation with t-BuLi in the presence oxygen set the stage for regioselective epoxide opening with sodium azide yielding alkyne 13. 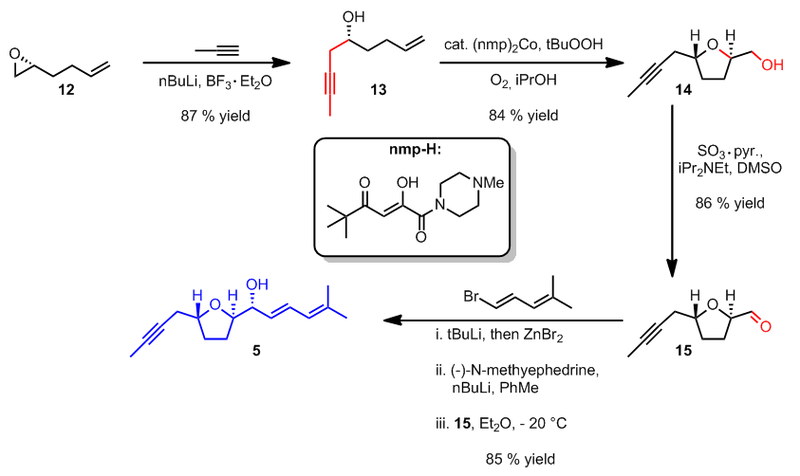 Gold catalyzed oxygenation was followed by Enders’ diethylzinc mediated epoxidation and Boc protection to give a 1 : 1 mixture of epoxides 15a and 15b. Interestingly the Martin group also utilized the same strategy to introduce the unsaturated ketone and Enders’ epoxidation. 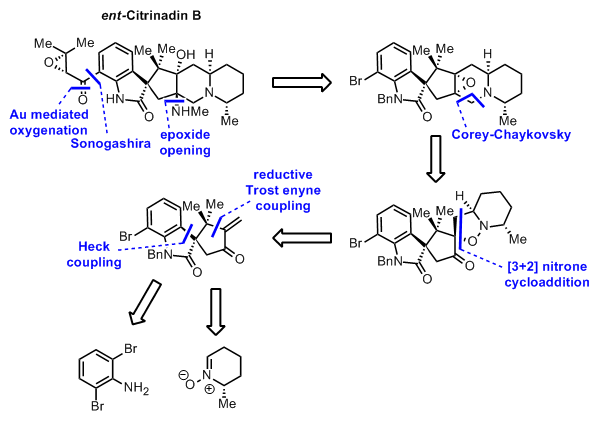 These could be elaborated by a three step sequence into ent-citrinadin B and citrinadin B. At this point the group surprisingly found that the published spectra of citrinadin B matched with the spectra of what was believed to be ent-citrinadin B. 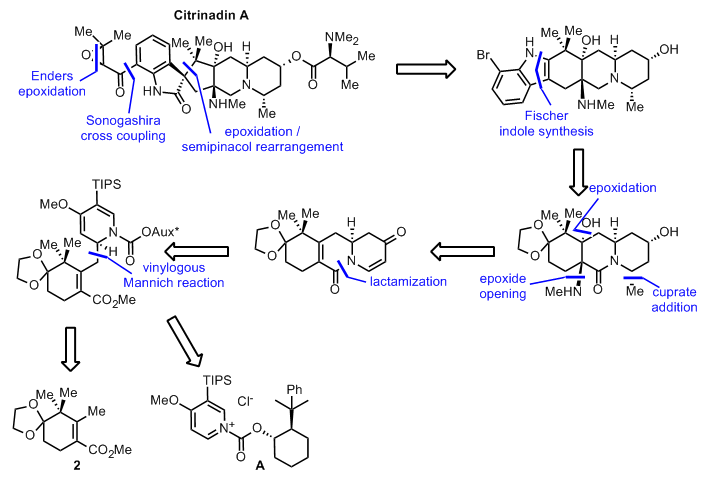 Stay tuned for the Martin synthesis of citrinadin A. Finally I found the time finish this nice paper form the Fürstner group. I was super busy the last weeks finishing some reports but I really wanted to feature this cool piece of work. 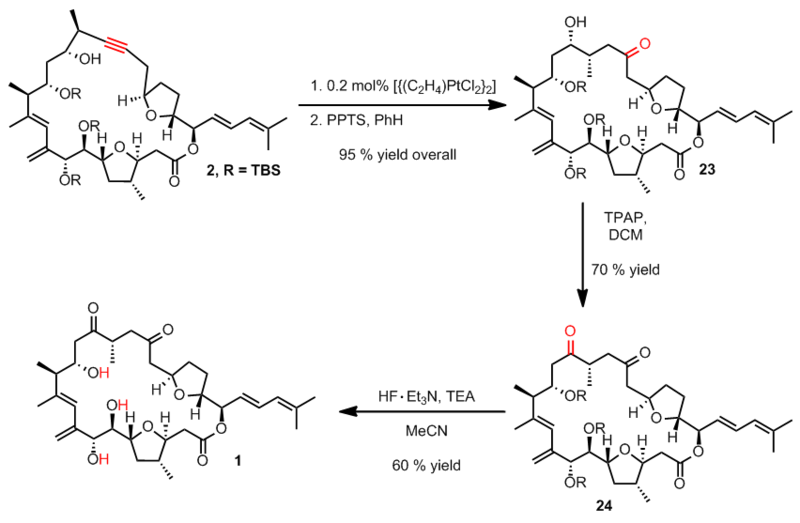 This is the second total synthesis of amphidinolide F published so far, the first one dating back to 2012. Due to a promising biological profile i.e. exhibition of high cyctotoxicity against lymphoma and epidermoid carcinoma cells quite some endeavors towards syntheses of the amphidinolides have been undertaken. It should be noted that only amphidinolide C proved to be highly bioactive. The general synthetic plan is outlined in scheme 1. 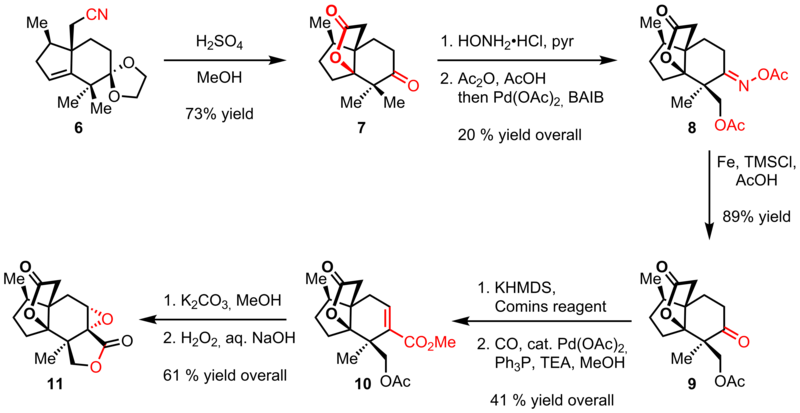 The key steps being first the disconnection of the uncommon 1,4-diketone into a homopropargyl alcohol to give 2 which could be assembled by a RCAM to give acyclic precursor 3: This was broken down into three fragments of similar complexity which were stitched together by a Stille coupling and an esterification. The synthesis of red fragment 4 began with monosilylation of propanediol and TEMPO oxidation to give aldehyde 7. 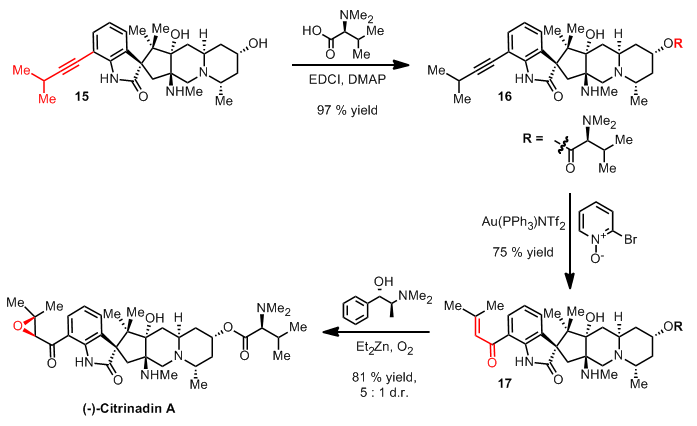 Palladium mediated Marshall reaction furnished alcohol 8 which was pushed forward to aldehyde 9 through a four-step sequence consisting of deprotection/bis-protection/mono-deprotection/oxidation. A second indium mediated Marshall reaction yielded bisalkyne 10 in good yield. After TBS protection of the free alcohol a nice sila-cupration with subsequent methylation gave enyne 11. Next the TMS group was removed, the resulting alkyne methylated and the vinyl silane transformed into the corresponding vinyl iodide producing red fragment 4 in good overall yield. 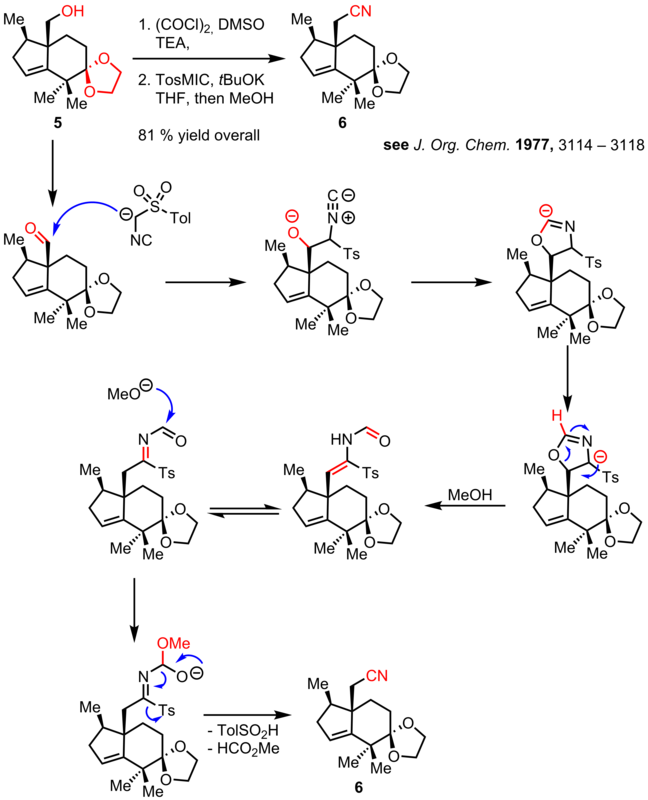 Blue fragment 5 was synthesized in a straightforward manner starting from readily available epoxide 12 which was alkynylated with propyne to give alcohol 13. 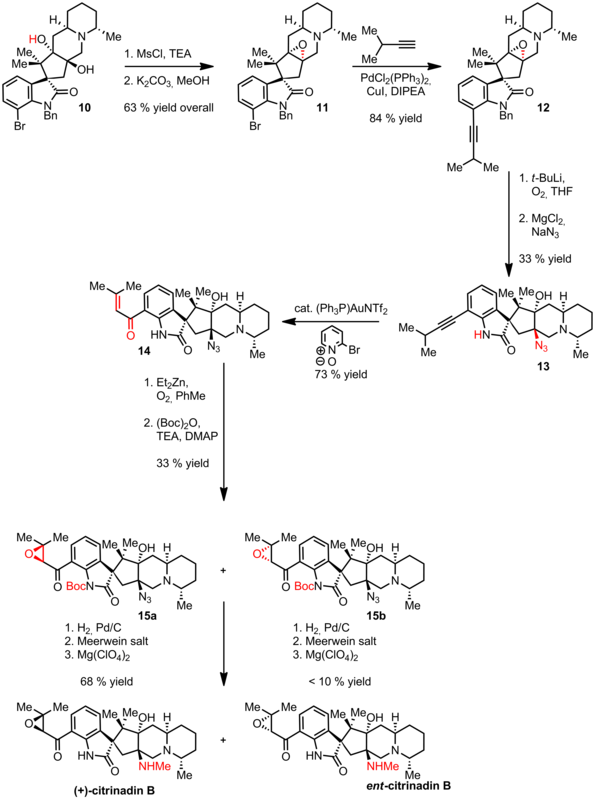 The next step made use of a facile cobalt mediated Mukaiyama oxidative aerobic cyclization yielding tetrahydrofuran 14. Parikh-Doering oxidation and subsequent N-methylephedrine mediated alkenylation furnished diene 5. The synthesis of green fragment 6 began with elaboration of readily available lactone 16 which was protected and methylated to give 17. 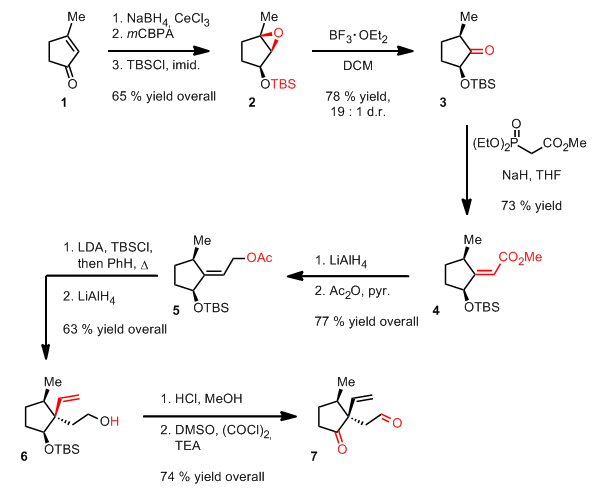 Monoreduction and Wittig olefination provided alcohol 18 and after TBAF mediated cyclization followed by trityl cleavage tetrahydrofuran 19. Swern oxidation and subsequent proline catalyzed aldol reaction delivered ketone 20 which was protected and transformed into silyl enol ether 21. Palladium mediated stannylation and saponification of the ethyl ester then generated green fragment 6. With all three fragments in hand the group could finally stitch everything together. Blue and green fragment 5 and 6, respectively were combined under Yamaguchi esterification conditions. After some optimization fragments 22 and 4 could be joined together in a facile Stille coupling to give RCAM precursor 23 in moderate yield. Two strategies were probed for the next step which turned out to give very similar yields. In a first shot the RCAM was run first with catalyst A followed by PPTS mediated TES deprotection. In a second round the TES group was removed first and the RCAM run in the presence of catalyst B. 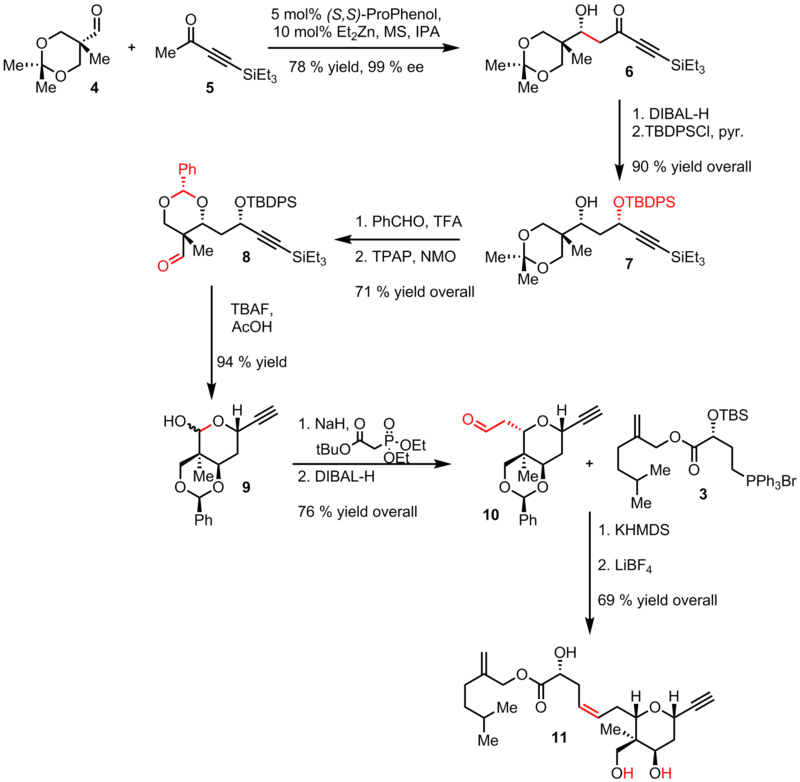 The resulting homopropargyl alcohol was then cyclized with catalytic PtII to give an intermediate dihydrofuran which was opened up to provide ketone 23. 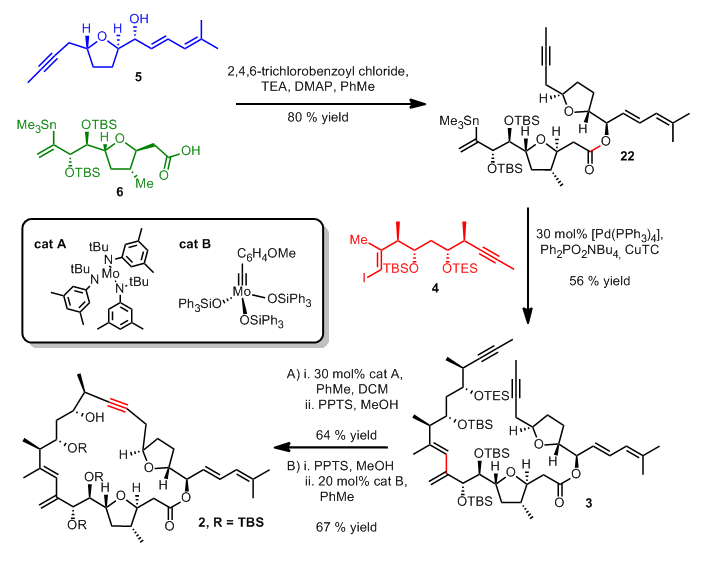 Ley oxidation and final global desilylation of three TBS groups under earlier reported deprotection conditions yielded amphidinolide F in good overall yield.